Stan Lee: the Legend himself. Here’s an apocryphal story, a legend from the annals of comics history: In 1961, a Marvel publisher was golfing with a friend who was an executive from DC Comics. The DC executive was bragging about the runaway success of the Justice League, the super-team consisting of Superman, Batman, Wonder Woman, and assorted other DC A-listers. 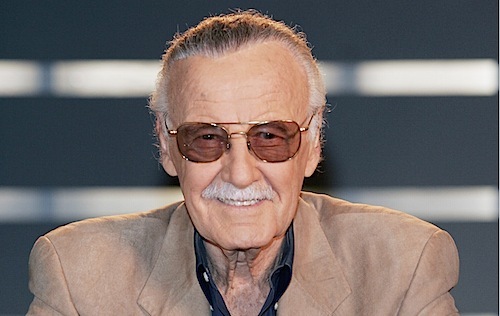 After their round of golf, the Marvel publisher called his most trusted writer, Stanley Leiber (who had taken the pen name Stan Lee in a regrettable time of prejudice against people of Jewish descent), and directed him to come up with a team of superheroes that could compete with the Justice League. Lee and his creative partner Jack Kirby collaborated to create perhaps the most popular and influential comic of the 1960’s: The Avengers. For my money, the coolest logo Marvel has to offer. And so began the Silver Age of Comics for Marvel. It seems weird now to think that the Fantastic Four predated the Avengers as competition for the Justice League, especially when you think about the Avengers‘ creation two years later, and that the Avengers are a much closer analogue to the Justice League than Reed Richards and his associates. It was suggested that I write about the Avengers and their history this week since the so-incredibly-anticipated-it’s-a-little-bit-ridiculous-but-since-it’s-Joss-Whedon-maybe-it-really-will-be-that-good film adaptation of the Avengers comes out this week. I started that article, but you know what? I wanted to write about the Fantastic Four, dammit. I feel they’re somewhat under-appreciated in the current comics world, which may be in part to the perception that the best the Fantastic Four has ever been was when Lee and Kirby were the creative team behind it in the 1960’s (John Byrne had a great run in the ’80’s, but it was basically re-hashing old Lee and Kirby stories. Not that that’s bad thing). Fantastic Four #1. Cover art by Jack Kirby. 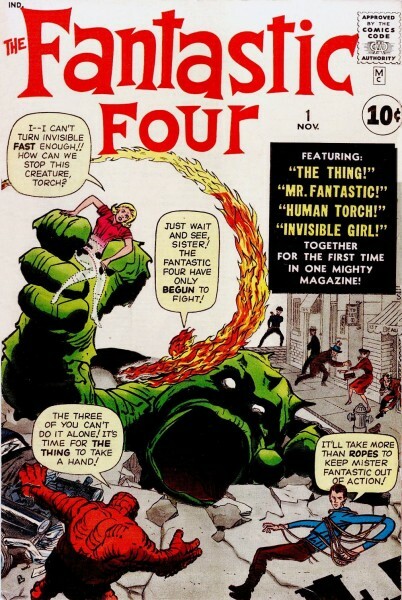 Consisting of Mr. Fantatsic, the Invisible Woman (who later gained additional, better superpowers), the Thing, and the Human Torch, the Fantastic Four were just so relevant, so perfect for the early 1960’s. In the middle of the Cold War, at the dawn of the Space Age, Fantastic Four #1 told the story of four friends who test-piloted a rocket into space, and gained superpowers from mysterious cosmic waves found there. They came back to earth, started battling evil, and became celebrities (they uniquely made no attempt to hide their identity). Men wanted to be Mr. Fantastic, and women wanted to be with him (no doubt due in part to his ability to stretch his body parts to incredible proportions). 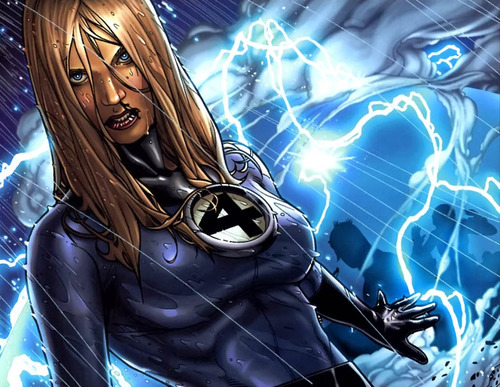 His girlfriend, Sue Storm, was a blonde bombshell who was the toast of the town. It sounds completely ludicrous now (and make no mistake, it did then, too), but that was the Fantastic Four. There was also the kindly old mailman Willie Lumpkin thrown in for good measure. The Fantastic Four were the first homogenous superhero team, which is to say they differed from the Justice league and the Avengers in that they were all created at the same time for the purpose of being on a team together. The Justice League had an assortment of characters who all had their own individual comics to begin with, and the X-Men were still two years away (also being published in 1963). So when you go see The Avengers next week, have a great time, but don’t forget about Marvel’s original super-team. 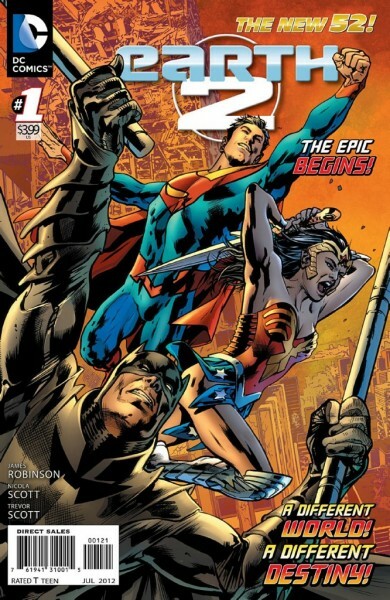 Earth 2 #1, James Robinson, Nicola Scott: This week, James Robinson and Nicola Scott explore an alternate, parallel universe origin story for the New 52’s Justice League and their battle against Darkseid. A little bit contrived? Maybe. Still interesting reading, though. Earth 2 #1. Cover art by Ivan Reis, Joe Prado, Rod Reis. Batman: The Man Who Laughs, Ed Brubaker Doug Mahnke, Patrick Zircher: It seems like I recommend something by Ed Brubaker every other week. In this graphic novel, Brubaker pens two stories that explore the twisted relationship between Batman and the Joker. Excellent Bat stories, and excellent crime fiction. As always, Brubaker delivers. 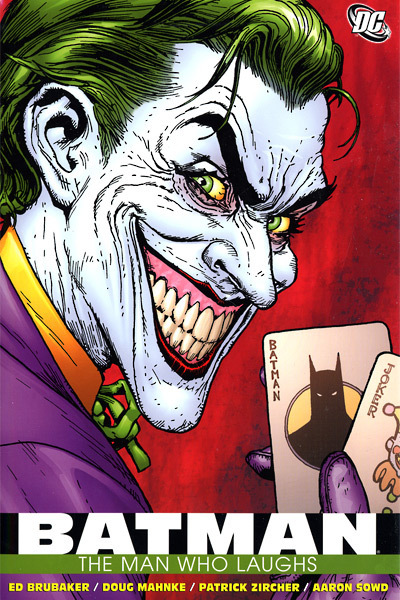 The creepiest the Joker has any right to be. Art by Doug Mahnke. Tagged Avengers, Batman, Cold War, cs, Fantastic Four, Human Torch, Invisible Woman, Jack Kirby, Justice League, Space Age, Stanley Leiber. Bookmark the permalink.